Co founder of the Sox Booster Club, chair for 6 years of the Jimmy Fund, Ken was also inducted into the Red Sox Hall of Fame. As a young boy growing up in Quincy in the 1930’s, Ken Coleman would listen to Fred Hoey calling Boston Braves and Red Sox games on radio. Hoey’s work fired Ken’s ambition to become a sportscaster and after serving in WWII, and with a Curry College degree in hand, he began his broadcasting career with the Rutland Royals baseball team. Then it was on to Ohio where he did both radio and TV play by play work for the powerhouse Cleveland Browns football team and the Cleveland Indians baseball team. While there, he called Ted Williams’ 500th home run. In 1966, when Curt Gowdy stepped down as the voice of the Boston Red Sox, Ken finally got his dream job. For the next 23 years, with a brief hiatus in Cincinnati, he called countless Sox games and plays, including the “Impossible Dream” season of 1967. 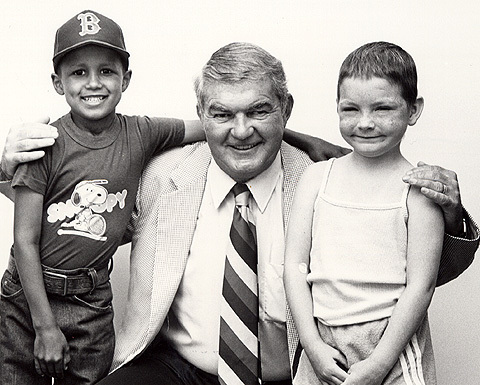 Cofounder of the Sox Booster Club and chair for six years of the Jimmy Fund, Ken was also inducted into the Red Sox Hall of Fame.